How many words should an exhibit label contain? At what age level should the text be written? In the Museum Practices course I teach at the University of Memphis this question always elicits responses ranging from the minimalist to the verbose. Students are able to cite the canonical Museum texts (e.g., Serrell, Spencer) to prove their point. A couple of years ago, I had a transformative experience on this issue. In my Native People’s of North American course, for her class project, then University of Memphis graduate student Nora Bridges created an exhibit on Native American plant use for the C.H. 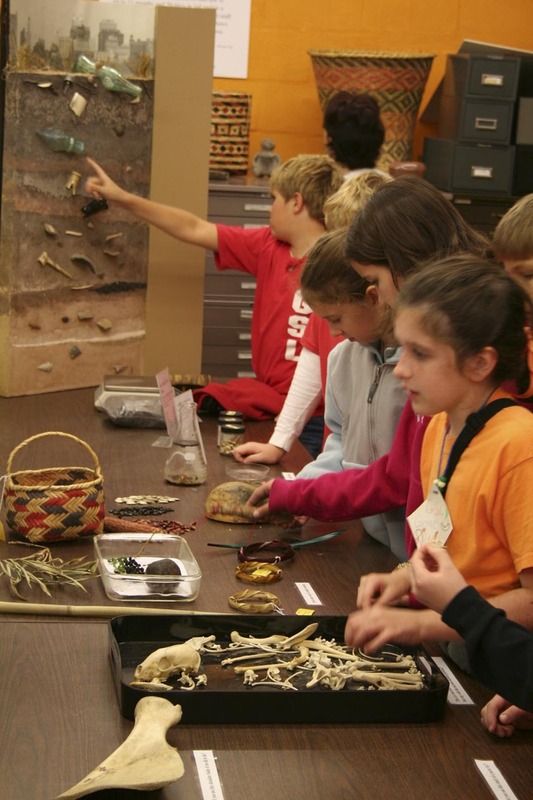 Nash Museum’s Hands-on Archaeology Lab. The lab exhibit is geared toward the young and old alike, but the emphasis is on a tactile exploration of how archaeologists interpret archaeological sites. Nora initially produced a 2 x 7 foot banner display with over 1000 words of text and 49 references organized under headings such as Biodiversity Conservation, Ethnobotany and Applied Anthropology, and Prehistoric Plant Use in the Southeast. We cut back, dramatically, the amount of text Nora provided for the plant use exhibit in the hands-on lab. The display now includes step by step instructions on how to dye fabrics as done in prehistory, along with samples of the plant materials used as dyes and swatches of dyed fabrics. This station in the lab exhibit also has information on ethnobotany and Native plant use and physical examples of plant materials used in creating basketry and as foods. The ethnobotany station contains a total of not more than 150 words of text on a 2 x 4 foot display accompanied by the “hands-on” materials. Next, we took the basic information from Nora’s original banner, deleted all the references, condensed the text, and created a 2 x 7 ethnobotany banner exhibit in our main museum hall next to existing plant material displays. W are now preparing a two-sided rack card takeaway with “for more information” resources, including a link to our Museum website where the full text of Nora’s original banner, along with her 49 references will be available to those seeking the greater detail. Finally, along our nature trail, arboretum, and in our herb garden are over 100 plant species that provide opportunities to discuss the other aspects of ethnobotany included in Nora’s banner. We are developing audio tours with drill down options where Nora will be able to further explain these topics. The solutions above draw on simple and reasonably inexpensive technology to take a subject like ethnobotany and address the multiple interest levels of our museum visitors from elementary age children to adults. These solutions are also flexible and can be readily added to or subtracted from as the need or new information comes along. Given the ability to create exhibits at multiple levels, “it depends” may be the best answer to the questions at the top of this post. How have you addressed this aspect of exhibit content?